Naples is of the most impressive art cities in the Mediterranean. It is the capital of the Campania region and ranks third for being the largest Italian municipality, after Rome and Milan. 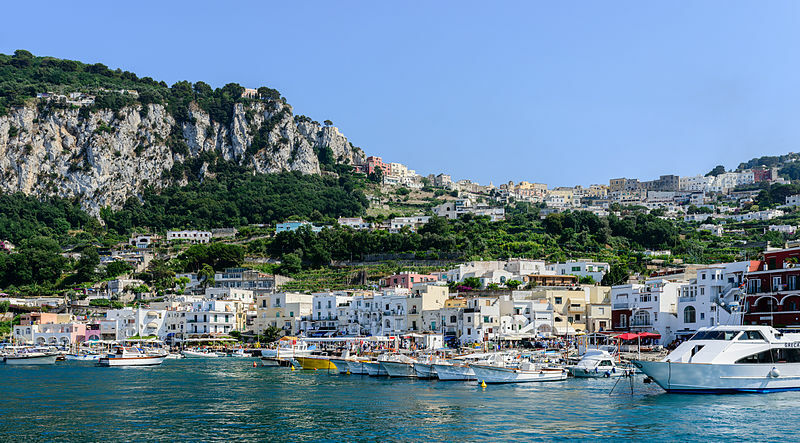 The city dominates the gulf that carries the same name, that goes from the Sorrentine peninsula to the volcanic area of Campi Flegrei and offers a suggestive view of the impressive volcano Vesuvius and of three beautiful islands: Capri, Ischia and Procida. When arriving in Naples you can’t not see the Piazzetta by walking through the tables of the cafes. This is where all the vip – and not only – have a seat to enjoy a coffee, an aperitivo (happy hour), a drink after dinner, to chat, admire the beautiful view and often also to have other look at them. The Piazzetta was the centre of local life even in the past, home of the vegetable and fish market. In 1983 the young Raffaele Vuotto from Capri arranged some tables and the Piazzetta became a more social place. Since that moment, it has been the main meeting point for the social life of the island, that took place in hotels and private homes before then. In the eastern part of the Island you will be able to visit Villa of Jupiter, called this was because it is located next to the temple of Jupiter. It is famous for having been the home of the roman emperor Tiberius Julius Caesar and the government building of Rome between 26 and 37 A.D. Today, Villa of Jupiter is a historically important archaeological site because of its admiring beauty. From this Villa you will be able to see the Island of Procida, Ischia and also the gulf of Salerno and the land of Cilento. Villa San Michele is just as beautiful. This is a residence in the municipality of Anacapri. It is the realization of the Mediterranean dream of a young doctor and writer, Axel Munthe, who arrived in Capri and decided to build a villa on the ruins of an ancient chapel dedicated to San Michele. The result was a building on more levels: his office is on the first floor while the lodge crosses pergolas and columns to reach a circular viewpoint that overlooks the Gulf of Naples. In the north-western part of the island of Capri you will see the beautiful Blue Grotto, a natural cavity which is long about 60 meters and wide about 25 meters. The entry is 2-meters wide and only 1-meter high. In order to visit it, you will be taken on small rowboats, 4 people at a time. The sailor men of Naples will take you around on their boats; once inside the cavity everything will change colour: there will be blue and clear reflexes on the surroundings, all accompanied by Neapolitan songs. • Our driver will be directly to your hotel, or at the address indicated by you, with the car you have booked. • Our rates DO NOT INCLUDE private guide, entrance fees and meals, unless it is specified in your booking. • It is recommended to wear comfortable shoes.